A Matter of Memories: :MEMORYWORKS EXPRESS: July 2010 Kit - "Bon Voyage"
:MEMORYWORKS EXPRESS: July 2010 Kit - "Bon Voyage"
Pack your bags and drive, fly, bike or scoot but get here soon! Take a trip with us this month with our new MemoryWorks Express kit, "Bon Voyage"
Packed full of fun travel-themed patterned paper, elements and accessories, you'll travel far and wide to get one! 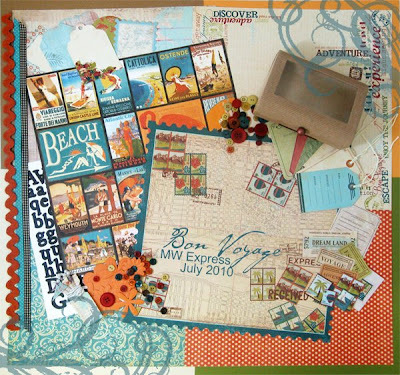 Check out some of the beautiful projects that the MemoryWorks Design Team has created with this wonderful kit and find more details in the July 2010 Idea Express download including four exclusive PageMaps layout sketches!